Ever wanted to see what's happening on your server while you're not online? With ChestShop-Notifications, you will be able to monitor your server's economy. ChestShop-Notifications allows you to show desktop notifications (like Windows or Mac OS X) for events linked with ChestShop, such as shop creation or a transaction - allowing you to have an in-depth look into your server's doings. 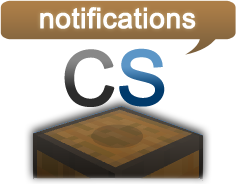 After installing both ChestShop and Notifications plugin, download the ChestShop-Notifications plugin and put it in the /plugins folder. Once you start the server, a config file will be created, in which you will be able to configure the plugin to your needs. I have all the newest Jar files for ChestShop and yes Notifications is loaded as well. Hope you can find time to help with this error. @jeffersonhernandez142 You don't have Notifications plugin installed. Error - I have the right version for 1.6.2, but it didn't work. Here is the error message. @Liger_XT5 That's how the Notifications plugin currently works, but I suspect that in the (near?) future it will be possible to connect to your server via the internet. I assume this only works if the server itself is running on your computer?